The first impression is inimitable. Therefore it’s important that our smile is as beautiful as possible. In 2017 aesthetic dentistry is offering many professional possibilities to make the teeth very nice. But what makes your smile self-conscious? Digital Smile Design helps to find the best solution for your individual expectations with it’s help you you can check the final result before any treatment has been commenced. At Evergreen Dental all aesthetic dental treatments are planned thoroughly. In doing so a special dental software is assisting us by perfectly visualizing the final result, your new smile. Naturally beauty and health go hand in hand therefore not only the changes in aesthetics but also in the general health status are predictable. Another great achievement of Digital Smile Design is that it allows you to co-design your new smile by participating in the planning. That means that you can adjust the treatment together with your dentist in order to make sure that the final result will meet your expectations. What are the advantages of a Digital-Smile-Design? predictable end result: thanks to Digital Smile Design you can check the final result beforehand to make sure your new smile meets your expectations. During the planning you are not only confronted with the aesthetic but also with the functional changes. efficient cooperation between dentist and patient: The smile design makes the consultation between patient and dentist more efficient and successful. Also the laboratory can work with it as the final result to be achieved is previously defined and visualized. The measurements will be even more precise therefore the aesthetic, rehabilitation and tooth regulating treatments will be much more accurate, the realization of the dental work much more successful. A final result that matches you perfectly: When doing a smile design we not only watch out for the positions and condition of the teeth but also consider the face form, the character, the mimics. This way we can ensure that your new smile will be natural and is harmonizing with the overall optics. What happens exactly during a smile design? Consultation. Our dentist informs him/herself during the consultation about your expectations and demands and uncovers the problems to be solved. Making an X-ray or CT-scan. 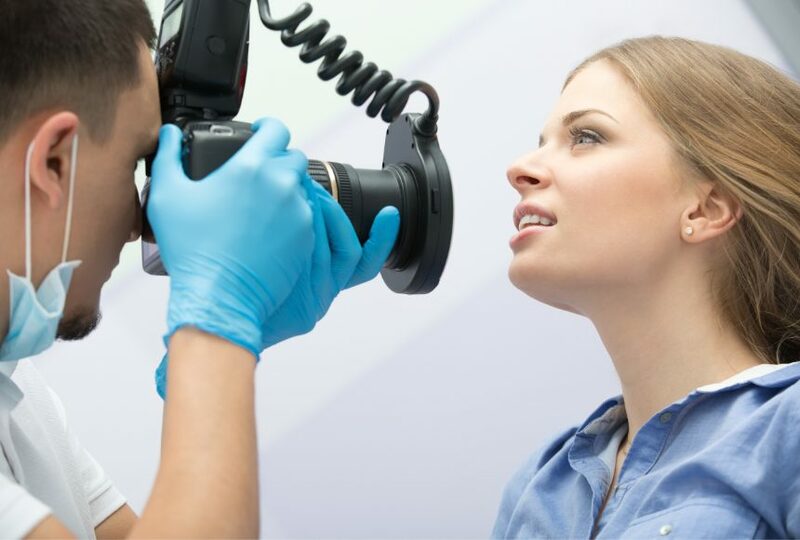 After the detailed consultation we take photos of your jaw in order to fix the individual conditions and face forms and the smile best characterizing you. Another important aspect of making scans is the purpose of uncover eventual problems or irregularities not visible otherwise. Saving the data. Based on the consultation and the X-ray or CT-scan all important data is stored in our system and the planing software. Smile design and fine-tuning. During the process of digital planning you’ll get a reliable picture about the future look of your teeth we will realize step by step during the treatment. After the face and smile planning you have the possibility to co-design your teeth and to influence the final result according to your imaginations. If you are happy with the outcome it will be saved by photo documentation in order to be able to double-check the result after the treatment. Making a treatment plan. After the smile design your dentist makes a detailed treatment plan stating the further process in terms of time and costs. This way only positive surprises may occur. Treatments. After accepting the offer the treatment can start. in order to get to your new smile and to restore the dental health various aesthetic treatments may take place. These could be anything from whitening through rearrangement of the teeth all the way to putting implants and/or crowns or veneers. In order to make it easier for you to get to your “Hollywood-smile” we offer down-payment possibilities. To whom do we advise to make a Digital Smile Design? To every patient in need of a big dental work as your smile will anyway change for sure, thanks to the planning of course only into the positive direction. Before a job interview or an important appearance when the time is only sufficient for cosmetic changes instead of a complex treatment. To everyone who would like to get a picture about the end result of a dental treatment and who not only would like to imagine but also would like to see the result beforehand. To everyone who allocated a major importance to aesthetics. In case you have further questions about the digital smile design get in touch with us. Teeth whitening but in a smart wayWhy is toothache so nagging?